LONDON, Jan 12, 2015/ — It’s been over 40 years since Stanley Kubrick’s “A Clockwork Orange” hit theaters, yet this dystopian crime film continues to titillate the current generation’s imagination. 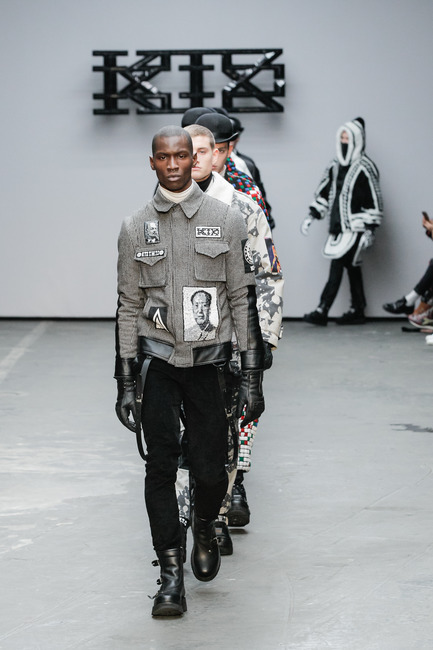 Paying homage to the classic film, KTZ founder and designer Marjan Pejoski brought Alex, the English villain and main character, center stage. The famed bowler hat was the accessories de rigueur. Following the film’s dystopian theme, Pejoski translated Alex’s propensity into taking pleasure and personal amusement by taking innocence from others into black and white collection done in rubber and leather. And to give a nod to winter, Pejoski also took inspiration from the Inuit of Alaska as he sent fur framed parkas on the catwalk.